Combines wide dynamic range with wide bandwidth and both over the entire gain range, not just a "sweet spot"
A standard XLR cable links the GC34 gain control (top) to the Model 4 single-channel preamp (center) or Model 5 dual-channel preamp (bottom). The Model 4 also includes onboard controls. 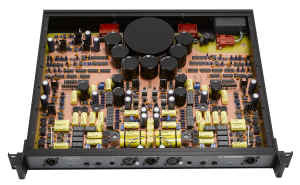 Preamplifier design concepts have not changed much since the advent of electronic amplification. Fixed elements (gain and buffer stages) and variable elements (attenuators or feedback) are arranged in a fixed signal path. Signal is amplified far more than is required, attenuated to the desired level, and buffered at the output with little regard for the load. Gordon Instruments has developed a "soft signal path" concept where each stage and the path itself are variable, optimized automatically for the selected gain and the output load. 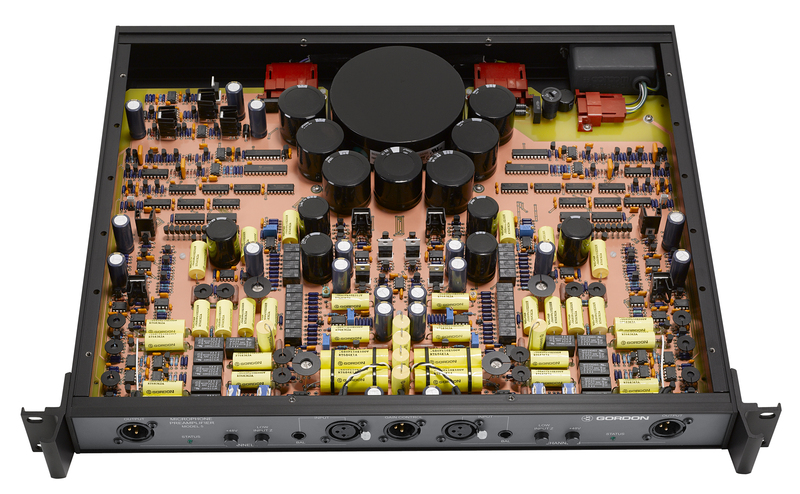 This innovation has been incorporated into the Gordon Microphone Preamplifier System along with high-resolution analog design, component, and assembly technologies, forming a very powerful sonic combination. The primary source of distortion in any preamplifier is gain. In conventional microphone preamps, the gain in the signal path (or open-loop gain) is fixed, equal to the maximum setting of the gain control(s) plus make-up gain for loop feedback, filters, etc (op amps typically have over 100dB of gain to allow for feedback). Because the gain is fixed, gain control is actually performed by variable attenuators or by variable loop feedback. As a result, the audio input signal is amplified by large amounts of fixed gain only to be cut back down to the level desired at the output. In the Gordon mic preamplifier, the gain in the signal path is variable, equal to the actual setting of the gain control, with no loop feedback, no attenuators, nor the associated redundant gain. In addition to gain, dynamic range and distortion are also optimized for each control setting. The audio signal at the input is amplified only by gain equal to and optimized for the gain control setting, significantly improving every aspect of sonic and measured performance. Outboard microphone preamp outputs see a wide range of loads due to signal frequency, cables, transformer inputs, and electronic inputs, varying from less than a hundred to over a million ohms. Distortion varies with load and can be minimized for a particular load by setting the operating parameters of the typical output stage. Change the load, however, and distortion increases. Automated output load compensation in the Gordon mic preamp couples an output load sensing circuit to a variable-parameter output stage. The output signal is monitored to determine the load while the output stage parameters are adjusted accordingly to minimize distortion. Extensive support circuitry optimizes a minimalist signal path. Symmetrical layout helps ensure matching channel characteristics and extremely low noise and crosstalk.